“Bottom line is there is clearly a huge error in the USHCN adjustments which has added a non-existent one degree hockey stick warming to the official US temperature record, and I now know just where to look for it in their code,” Goddard wrote. “NOAA made a big deal about 2012 blowing away all temperature records, but the temperature they reported is the result of a huge error. This affects all NOAA and NASA U.S. temperature graphs, and is part of the cause of this famous shift.” Citing satellite data, Goddard also said that by 2008, U.S. temperatures had cooled down below 1980s and 90s levels. Respected climatologist and NASA scientist Dr. Roy Spencer actually showed evidence of what Goddard described as early as April of 2012, saying that “virtually all of the USHCN warming since 1973 appears to be the result of adjustments NOAA has made to the data.” Commenting on the latest findings, Dr. Spencer said that his own examination of the data and corrections to account for urban heat island (UHI) effects “support Steve’s contention that there’s something funny going on in the USHCN data.” He also called the NOAA methodology for adjusting the data “opaque” and said he believes it is prone to serious errors. When asked in a follow-up whether the findings suggesting that the data “adjustments” had turned a cooling trend into warming or whether there were any inaccuracies in Goddard’s analysis, the agency did not respond. “Scientists also have other ways of confirming warming using many other independent measurements such as declining lake and river ice and snow cover extent, and increasing temperatures as measured from satellites and weather balloons and others,” the NOAA statement added. As The New American has reported extensively in recent months, despite NOAA’s claims, its own data show that Antarctic sea-ice coverage hit record levels again in 2013. Sea-ice coverage globally on Dec. 31, 2013, meanwhile, was the highest since records began. 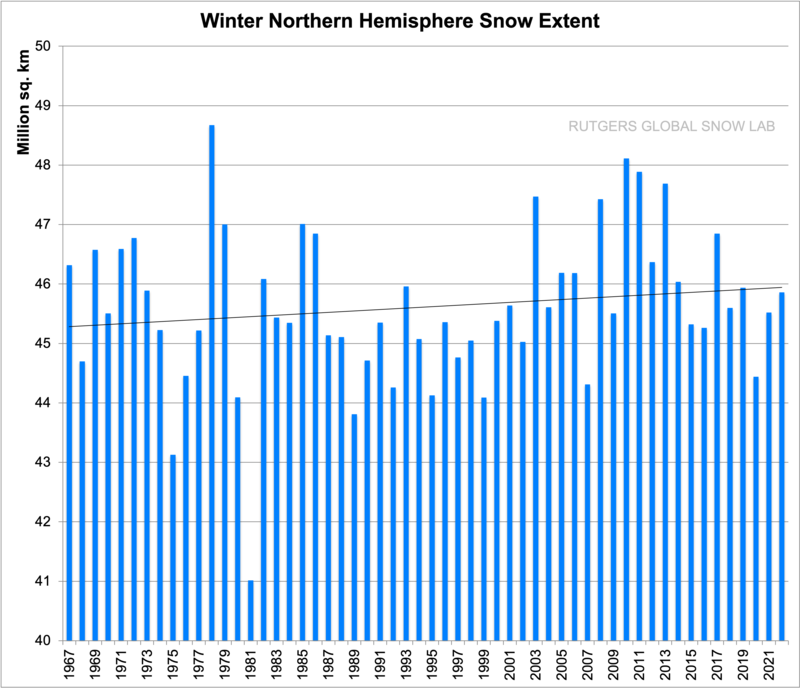 Finally, snow coverage for the Northern Hemisphere last year was the fourth highest on record, according to data from Rutgers University’s Global Snow Lab. NOAA did not respond to subsequent requests for comment on the issues. Even if the controversial “adjustments” of the U.S. temperature record criticized by numerous experts are accepted as legitimate, countless scientists said this month that the latest data from U.S. government bureaucracies confirmed again that “global warming” has been on so-called “pause” for some 17 years — and counting. All 73 United Nations climate models predicted significant warming over the same period. The record high Antarctic sea-ice coverage confirmed again this month by NASA and NOAA, surpassing the previous records set the year before, also defied alarmist forecasts of shrinking polar ice. The findings highlighted by Goddard and other experts bring to mind the infamous “Climategate” scandal, too. In a series of explosive leaked e-mails, many of the leading “climate scientists” behind the UN-backed theories on alleged man-made global warming were exposed conspiring to “hide the decline” in temperatures to further what was referred to as the “cause.” The documents also showed, among other revelations, that the alarmists were plotting to silence scientists who dissented from their controversial theory. In the end, Climategate led to what many analysts still suggest may have been the beginning of the end for the effort to impose global carbon taxes on humanity. Since then, the climate models behind the alarmism have become increasingly discredited as the predictions failed to materialize. Indeed, as The New American has been reporting in recent months, experts say 2013 was potentially the most devastating year so far for proponents of catastrophic man-made global-warming theories, with reality increasingly at odds with the models and predictions. It remains to be seen whether the latest allegations by Goddard and others of improper U.S. government temperature-data manipulation will serve to hasten what analysts say is the ongoing implosion of global-warming alarmism. At this point, however, a growing number of climate experts and scientists around the world are forecasting a period of potentially dangerous global cooling in the years and decades ahead.